Still, though. Someone should write a Why Evolution is True/Greatest Show on Earth-style book on the subject. There were a number of "Hothouse Earth" articles in the news recently. Here's the report behind them. I've been battling with my father over the concept of AGW and CO2's role in it. He's a smart man, worked as an electrical engineer for Hughes Aircraft company and knows a lot about the absorption wavelengths of CO2 and keeps arguing that the light that is absorbed is absorbed to extinction before hitting the surface of the earth and therefore adding more CO2 will not increase absorption. Thanks to my favorite YouTube channel I now have a better explaination for him. Do you have E-W hemispheres same as N-S? Or are they known by another name? East and West hemisphere are a thing. Defined by the prime and anti meridians. What prompted the question? Oh nothing really, I was having a discussion with myself and got stumped. That is REALLY effective !!! I've found a broad review of "climate change" titled under the old Global Warming term useful. It has some actual science that the general reader has access to. In there are a few lines I'd like to hear comments on. Is this still the correct way to see the molecular scale of events? The underlined part. The absorbed energy is vibrational energy. How does that relate to the gas molecules, how does it transfer to oxygen or nitrogen molecules? Temperature relates (with no IR radiation) to speed of gas molecules. (It's been about 40 years since I had physical chemistry, I no longer have any textbooks of those days). The mechanism by which IR radiation captured as bending or stretching of CO2 is passed on to other air molecules. The bonds within molecules all vibrate at temperatures above absolute zero. There are several types of vibrations that cause absorptions in the infrared region. Probably the most simple to visualise are bending and stretching, examples of which are illustrated below using a molecule of water. If the vibration of these bonds result in the change of the molecule’s dipole moment then the molecule will absorb infrared energy at a frequency corresponding to the frequency of the bond’s natural vibration. This absorption of energy resulting in an increase in the amplitude of the vibrations is known as resonance. 2040 - 1.5C Paris target ?? Global temperature is rapidly approaching the 1.5°C Paris target. In this study, we find that in the absence of external cooling influences, such as volcanic eruptions, the midpoint of the spread of temperature projections exceeds the 1.5°C target before 2029, based on temperatures relative to 1850–1900. We find that the phase of the Interdecadal Pacific Oscillation (IPO), a slow‐moving natural oscillation in the climate system, will regulate the rate at which global temperature approaches the 1.5°C level. A transition to the positive phase of the IPO would lead to a projected exceedance of the target centered around 2026. If the Pacific Ocean remains in its negative phase, however, the projections are centered on reaching the target around 5 years later, in 2031. Given the temporary slowdown in global warming between 2000 and 2014, and recent climate model predictions suggestive of a turnaround in the IPO, a sustained period of rapid temperature rise might be underway. In that case, the world will reach the 1.5°C level of warming several years sooner than if the negative IPO phase persists. Tero: Yes it's roughly the same area of chemistry. Will read to see what else is there. That real climate link explains the vibration very well. But it then just mentions emissions. Which is fine. We all know thst, the vibrating molecule emits IR back to earth or out, then stops vibrating. The older studies quoted seem to think green house gas molecules can pass energy to any molecule they collide with. The energy of gas molecules at any temperature can be calculated as a speed. Different from vibration. Last edited by Tero on Oct 27, 2018 2:01 am, edited 2 times in total. Macdoc wrote: 2040 - 1.5C Paris target ?? The human-induced warming trend has been at current levels of increase since the early 70's, running at +0.15C per decade, steadily (and catastrophically if it continues) for the last half-century or so. The natural warming trend has never been higher than +0.03C per decade for the entire post-industrial record. You're telling me that in the 11 years to 2029, we're going to see an additional 0.46C of trend warming (0.42C per decade), rather than 0.18C that would result from a continuation of current levels of human-induced warming and a swing to the high end of natural warming cycles, as proposed by the abstract you linked. So where's that extra 0.24C per decade going to come from? Natural warming at 900% of the previously maximally observed rate? Or human induced warming at 250% of the previously maximally observed rate, starting right now, or higher if starting later? Or some mix of the two? While my primary point is that these scenarios are not credible, my secondary interest is which pathway you think will kick us up that extra 0.24C per decade. What do you think will be radically different for the next decade to our current (disastrous) business-as-usual that's delivering +0.15C a decade, every decade? What's going to triple that rate, not over the coming century, but starting today? Genuinely curious as to your thoughts in directly addressing this question. Not at all interested in "Go ask the authors of that paper." I haven't got access to the paper, but from the plain English summary, this claim "the midpoint of the spread of temperature projections exceeds the 1.5°C target before 2029, based on temperatures relative to 1850–1900" does not accord with the temperature record in the graph above showing a trend post-industrial warming of just over 1C, and an observed warming rate that is, while disastrously high, a long way short of the 0.42C/decade required. 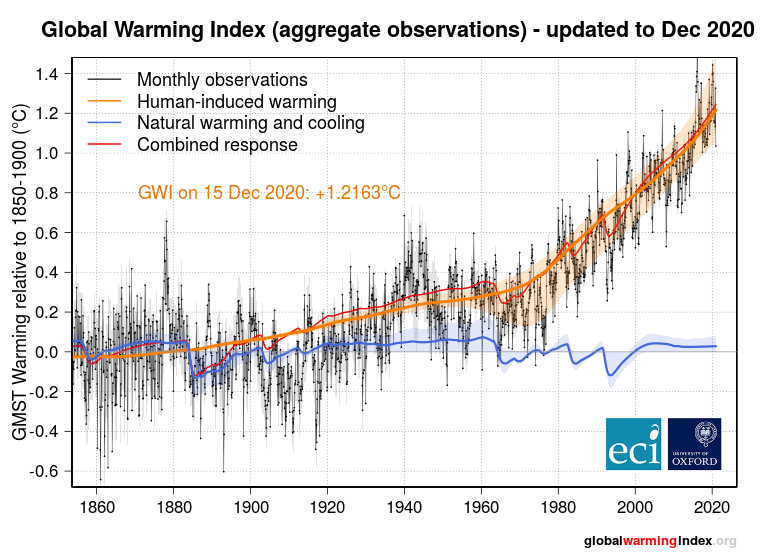 At the very least, could you produce a credible source for current projections for the decade 2019-29 of 0.42C trend warming, an overnight tripling of current rates of trend warming, because that's not something I've seen from anyone, including, but not limited to, the IPCC summaries of current projections. Credible sources will convince me. Your usual unsourced condescension and insults will not. and that article was from 18 months ago. I guess some are in more denial than others. 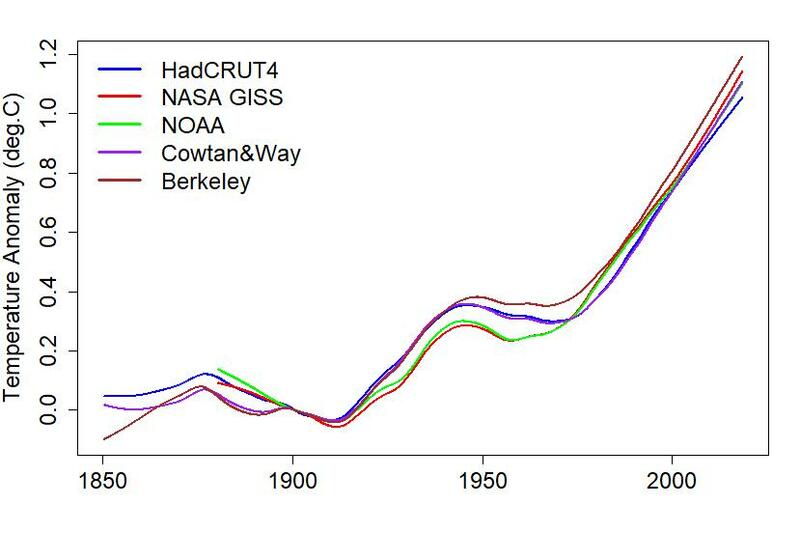 You are hanging your hat on HadCrut4 which effectively ignores the places where AGW id accelerating fastest. Another complication is that most estimates of how far we’ve come are based on the global temperature from the Hadley Centre/Climate Research Unit in the U.K. It’s a fine choice but possibly not the best, because by omitting the Arctic (the fastest-warming region on earth) it may underestimate the total temperature increase. It's far closer than the pablum being dished out .....will we avoid 1.5C?? So my answer is… no. and Andrew King showing that the 1.5°C target could be reached by between 2026 and 2031 depending on the phases of the Interdecadal Pacific Oscillation (IPO). The difference here is that the IPCC follows the pack, whereas Spratt cites quality recent research. There is a risk that the new research is right. However, policy makers will blithely ignore it until it is incorporated perhaps in the next IPCC report years down the track. Even this analysis of the recent IPCC 1.5C report puts the 1.5C date at 2034 in the interactive graph. That would help me analyse why you draw such different conclusions from the same data. Could you see your way to answering these fairly straightforward questions, without namecalling, please? (1) current warming over pre-industrial of around +1.03C perhaps as high as +1.1C for the sort of reasons you raise as criticisms of HadCRUT. (4) next decade may see IPO turn positive, and will have higher CO2e than previous few decades, so likely to warm at a faster rate. This, linked from one of your own sources, is close enough to my own perspective. I would have thought that an expert like yourself would have the knowledge required to churn out an answer to these pretty basic questions at your fingertips. Seems I thought wrong. How much has the planet warmed in the industrial period (leaving out short-term fluctuations)? At what rate is it warming (leaving out short-term fluctuations)? What rate of warming can we expect in the near future? If the expectation is for the future rate to be markedly different from the current rate, what's the cause? Why should Macdoc feel obliged to answer irrelevant questions? Using his extraordinary ability to think laterally, he has global warming solved to his satisfaction, dont'cha know? Just do as he says - pay $120 or so per annum into a fix-global-warming-fund. Voilà! No more global warming, so shove your likely trend warming rise over the coming decade and whatnot up your bum.